SUPERIOR EFFICIENCY TO KICKSTART YOUR BUSINESS. 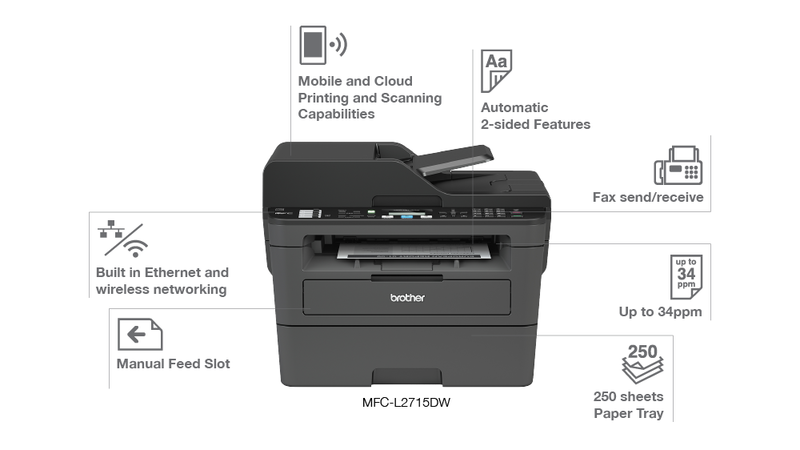 Designed for enhanced productivity and cost-efficiency, the Brother MFC-L2715DW mono laser Multi-Function Centre combines wireless and mobile printing, scanning and copying capabilities to deliver office-wide productivity that you can count on. 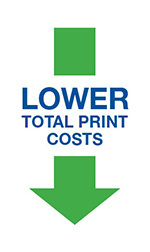 Count on business-class print and copy speeds of up to 34ppm, first page out in less than 8.5 seconds, and excellent mono print quality for sharp, clear text and graphics. Stay productive for longer stretches at a go with a 250-sheet default paper tray and 50-sheet Automatic Document Feeder. Start printing or scanning from your iPhone, iPad, AndroidTM or Windows® Mobile devices through Brother’s iPrint&Scan, Apple AirPrint, Mopria and Google Cloud Print. Print or scan effortlessly from your notebook PC, smartphone, or tablet without the need for wires. Print using the Brother iPrint&Scan app without having to connect to a network or entering any login credentials. Convenient and secure to offer temporary access to visitors! Enjoy greater print volumes at lower costs-per-page with high-yield 3,000-page replacement toner cartridges*. This ENERGY STAR® certified machine uses less energy to help cut your energy costs. Stacks up to 99 pages. Copyright © 1995 Brother Commercial (Thailand) Ltd. All Rights Reserved.